More than 150 UC Davis advisors gathered on October 11th for the Advising Fall Welcome, an event that showcases advising activities, addresses relevant updates, and recognizes accomplishments within the community. Executive Director of Academic Advising Brett McFarlane acknowledged the designation of the day as “A Day of Kindness” in memory of CA&ES advisor Joey Almario, whose smile and warmth resonated widely. In Joey’s honor, everyone was encouraged to perform acts of kindness toward each other. 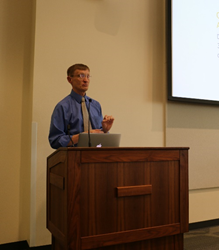 Donald Dudley, Director of the Office of Student Support and Judicial Affairs (OSSJA), spoke about the recently revised Code of Academic Conduct and discussed the responsibility for advisors with regard to the code. Advisors are expected to understand the code, help faculty, advise students accurately, and consult with OSSJA. Please refer to the UC Davis Code of Academic Conduct. The online degree audit system known as My Degree went live in early September. The tool should help students move through their academic career intentionally, make informed choices about course selection, and formulate and follow an academic plan. Project Manager David Garrison shared the My Degree objectives, development, functionality, and plans forthcoming. Advisors can attend training sessions that are currently being offered regularly through December. The My Degree tool will go live for students in January 2017. ATPD subcommittee chairs and program participants presented on professional development activities and plans for the year. Brandy Fleming and Michael Lemus, mentee alums of the AAMP program, presented personal perspectives about the value of the AAMP program. They credited the program for helping to boost professional confidence, build a more robust campus network, and foster an ability to recognize opportunities for further growth. Joyce Fernandez and Jordan Dade jointly chair the AAMP subcommittee of the ATPD. Wendy Haws and Chelsea Norris publicized an upcoming opportunity for peers to participate in a certificate track to acquire supplemental and transferable skills. The series consists of six approved workshops and a reflection paper. Wendy Haws and Erika Reynolds currently co-chair the Peer Advising subcommittee. To get involved, peer advisors should express interest via email. Subcommittee co-chairs Kelli Sholer and Perry Gee announced upcoming coffee talks for Fall, including a NACADA Conference Debrief, Debriefing Community Tragedies, and Self-Care through Crafting. They also discussed the workshop schedule details for 2016-17, from Level One Core courses to Level One Elective courses to valuable non-certificate courses offered through SDPS. UC Davis launched a new certification program last year that will continue to expand over time. Erin McMurry and Joe Lee celebrated the fact that the UC Davis Academic Advisor Certification Level One is currently in an ongoing sustainable mode with four core courses offered once quarterly, and three to four distinct elective courses offered throughout the year on a repeating annual basis. Kate Creveling and Eric Sanchez discussed plans and presented a framework for the UC Davis Academic Advisor Certification Level Two. Like Level One, the Level Two structure is rooted in five core competencies as recognized by NACADA: conceptual, informational, relational, technological, and personal. While Level One offers a clear structural design, Level Two has more fluidity to accomplish specific categorical requirements using different approaches. More information will become available as Level Two gets closer to launch. Kate and Eric encouraged participation from advisors to develop further content ideas, make contact via email to get involved. Fall Welcome attendees were given time to complete a short ATPD survey that will help inform planning for the future. After various attempts at scheduling the 2017 UCDAAC, the planning committee (Emma Martinez, Caitlyn McCarthy, Zachary Chestnut, and Elia Salgado) announced the confirmed conference date of May 2, 2017. The planning committee intends to modify the format for 2017 to create a more dynamic forum with increased opportunities for interaction and idea-sharing. The core committee is actively recruiting staff to help with planning efforts via a call for volunteers. Expect an announcement with further information about the conference theme to come. Proposals that focus on the identified theme will be given preference. Melissa Whaley announced that the Majors Fair will take place January 31, 2017. She intends to make some changes for the 2017 event, such as eliminating the outdoor tables for better flow and inclusivity. Major advisors should complete this survey to get involved. Undergraduate Education Assessment Coordinator Kara Moloney reported on the Academic Advising Assessment Task Force (ATF) and the work upon which the committee has focused. The Map-A-Palooza sessions that the ATF hosted throughout summer resulted in the confirmation of three aspirational principles in advising that students deserve: Informational Guidance, Intellectual Mentorship, and Developmental Relationships. Map-A-Palooza participants sorted advising activities into these categories with a fraction of “Fall-Out” items under general themes of Administrative Processes and Training & Development. The next step involves operationalization of the principles through a Principle→Outcome→Indicator→Data model. Brett McFarlane, Executive Director of Academic Advising, remarked on the 2016 California Collaborative Advising and Counseling Conference (CCACC). 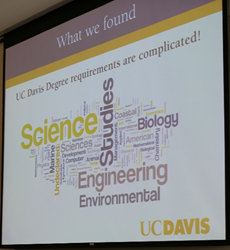 Many UC Davis registrants ended up on a waitlist after overwhelming interest from our campus. While unfortunate that the conference could not accommodate the number of interested individuals, McFarlane voiced pride in the level of engagement. The CCACC alternates between Southern California and Northern California locations annually so there will be another convenient opportunity to attend in the future. McFarlane mentioned a recent Audit & Management Advisory Services (AMAS) audit report of advising that the Office of Academic Advising will work to address throughout the year. Advisors may be approached to participate in these efforts, where applicable. Additionally, McFarlane discussed enhanced internal communication and partnerships, the addition of new positions like the First Year Coordinators, and a focus on strategic probation interventions. He acknowledged that we will face challenges throughout the year and encouraged staff to utilize connections and our distinctly collaborative advising community for shared support. The Fall Welcome concluded with an awards presentation, recognizing outstanding work in advising. 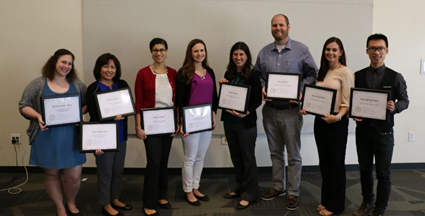 Congratulations to the 2016 UC Davis Academic Advising Award winners! Thank you to the advising community for attending and participating in the Fall Welcome. 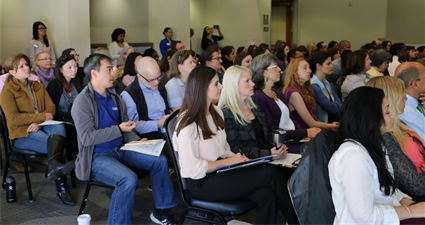 “I was so impressed with the turnout and collective energy at the [event]…I continue to be amazed at the dedication you all have to our UC Davis students and to the profession of academic advising,” said Executive Director of Academic Advising, Brett McFarlane following the event. McFarlane also recognized the “unwavering support” of Interim Chancellor Hexter, Interim Provost Burtis, Vice Provost and Dean Thomas, Vice Chancellor de la Torre, the College Deans and Associate Deans who together exemplify a unique unified support for academic advising. The ability to advance with such significant progress emerges from this top-level organizational support.